In 1834, the schooner Post Boy was headed to Chicago from its home port of Buffalo, New York. Caught in a heavy gale on Lake Michigan, the ship ran aground near what is now called State Creek. Faced with a wrecked ship and cold November temperatures, Captain Wessel Whittaker and his men had little choice but to walk along the lake to Michigan City, Indiana, roughly 10 miles southwest. From there they could hire conveyances to take them to St. Joseph. While en route to Michigan City, Captain Whittaker discovered the spot where the Galien River emptied into Lake Michigan. The site seemed perfect for a thriving port. Once Whittaker handled matters regarding his schooner, he returned to his hometown Hamburg, which was near Buffalo, New York. Inspired by visions of a settlement at the mouth of the Galien River – and the possibility of turning it into a port similar to Buffalo -- Whittaker convinced his employers to invest $13,000 to buy the land by the Michigan lakeshore. After surveying was completed, construction began. It was now official. New Buffalo was the newest town along the Lake Michigan shore. As buildings went up, Whitaker hadn’t forgotten his wrecked vessel, so he and other New Buffalo founders decided to lobby the government for a lighthouse. They felt emboldened by the nearby citizens of St. Joseph who had built their own lighthouse in 1831. Michigan City had recently finished theirs in 1837. Once the government agreed to the New Buffalo Light proposal, the town fathers selected a site for the lighthouse. Unfortunately they didn’t pay attention to the fact that it was located on a shifting sand bank very close to the lake, not the best foundation for a large stone building. Coincidentally, this property was owned by Captain Whittaker, who was no doubt happy to sell it to the government for $200. Next the town contracted a man to build the lighthouse. And who better to build it than the same person who had recently constructed the lighthouse at Michigan City. 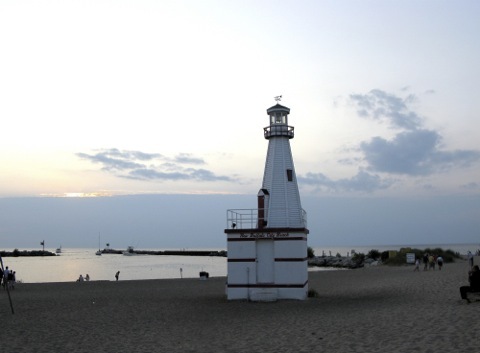 Not surprisingly, it was designed to be a near replica of Michigan City Light. Both the keeper’s house and the light tower were to be constructed of hard stone or brick. The tower would be 25 feet high, and the one-story keeper’s house would measure 34’ by 20’ with an adjoining kitchen area. Finally, eleven lamps and their 14-inch reflectors would provide illumination for the tower. According to the contract, the lighthouse was slated for completion October 15, 1839. The deadline came and went without a finished lighthouse. When construction finally ended, the results were alarming. The lighthouse was virtually inoperable. The tower dome leaked, soaking the lamps and their reflectors. So shoddy were the results that it seemed likely a government official had been bribed to sign or forge the inspection certificate. Only after Fifth Auditor Stephen Pleasonton threatened legal action did the contractor agree to make minor repairs. On January 3, 1840, New Buffalo appointed Thomas S. Smith as its first lighthouse keeper, paying him an annual salary of $350. But things continued to go wrong. When the light was officially exhibited that June, the building’s numerous structural flaws became even more apparent. The tower still leaked, and so did the brick walls. The lamps, which were a patented Winslow Lewis appliance, were so cheaply produced and ineffective that most sailors on the lake couldn't even see the lights that dimly illuminated the New Buffalo lighthouse. To make matters worse, the new lighthouse keeper never did any actual work. Instead, he lived in his own house seventeen miles away and hired someone else to perform his contracted duties. This was not uncommon for lighthouse keepers at the time. They often accepted the position of lighthouse keeper (which was not a highly regarded job) only to pay someone else very little money to do all the work, while they pocketed the rest of the government money. In fact, the St. Joseph lighthouse keeper was doing the exact same thing just 28 miles away. In August 1841, the Fifth Auditor removed Smith as lighthouse keeper. Frequent government handouts to friends had become so absurd that the Lake Michigan Superintendent recommended that the next light keeper of New Buffalo should be a gentleman called Mr. Webster...who had no legs. Since keeping the light required a certain degree of physical labor, Fifth Auditor Pleasonton successfully lobbied against such an unworkable appointment. Eventually Elijah Pressley was selected as the next light keeper. But Pressley wasn’t much better than Smith at carrying out his duties. In 1843, residents of New Buffalo circulated a petition calling for Pressley’s removal due to his frequent absences. Only the disheartening lack of competent lighthouse keepers at that time helped Pressley keep his job. The problems of New Buffalo Light seemed never ending. A Lake Michigan superintendent inspected the station in 1843 and was appalled at how filthy it was. His report described the nonexistent housekeeping skills of the keeper’s wife, while also mentioning that the keeper was – yet again – frequently absent. Eventually, Pressley became the recipient of enough bad press that he was at last fired. Reuben W. Smith received the position next in December 1845. He was replaced by Joseph Miller in 1849. Miller was fired in 1853, and Reuben Smith was appointed once again as keeper. Since most government appointments in the 19th century were viewed as gifts or rewards, it’s not surprising that such jobs changed hands each time the political landscape changed. Luckily Smith’s tenure as keeper was more successful than most. Or perhaps he simply had more powerful friends who held office. Smith’s position as keeper was strengthened when the Michigan Central Railroad completed its rail line to New Buffalo. With a rail depot in town, steamship businessman Captain Eber Ward launched a steamer service between New Buffalo and Chicago. This at last validated the existence of a New Buffalo lighthouse, which had always suffered from the lack of a working harbor. However even this stroke of luck vanished as soon as the railroad line extended to Michigan City and then Chicago in 1850, effectively ending Ward’s steamer service to New Buffalo. Along with unreliable keepers, New Buffalo Light continued to be plagued by construction problems. Built on shifting sand, the building’s foundations started to collapse in 1850. Just seven years later, the keeper’s house had to be demolished. But at least they had improved the light system. A vastly superior Fresnel lens finally replaced the malfunctioning Winslow Lewis lamp device in 1857. At long last, the lighthouse had a light system that could be seen from the lake. The only problem was there was no one out there looking for it. Ships headed for either Michigan City or St. Joseph; there was simply no need for a lighthouse in New Buffalo. There never had been. New Buffalo Light was always more useful as a political tool than a working lighthouse. For 21 years it was a source of government money and political favors. And for nearly all that time it had been the focus of numerous official requests to abolish the station. In August 1859, the government did just that. New Buffalo Light officially shut down, and was subsequently destroyed by erosion. 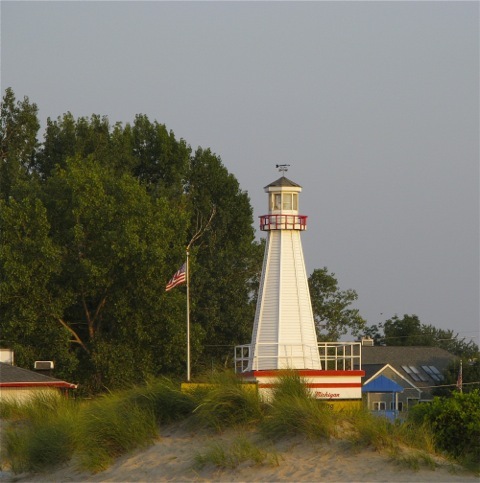 A small replica of the lighthouse can currently be seen at the entrance to New Buffalo City Beach. Great Lakes Lighthouse Tales by Frederick Stonehouse. Avery Color Studios, Inc. 1998. History of Berrien and Van Buren Counties, MI. With Illustrations and Biographical Sketches of Their Men & Pioneers. D.W. Ensign & Co., Philadelphia 1880. Press of J.B. Lippincott & Co., Philadelphia.